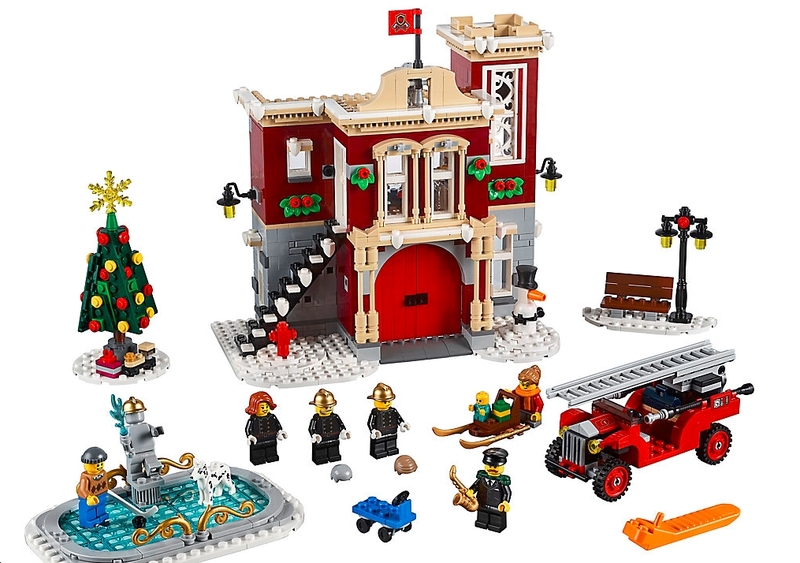 LEGO just released very exciting news- their newest in the annual “Holiday Village” series will be a fire station. Complete with a red fire truck, the fire pole we’d naturally expect to see, an ice-skating rink, and six minifigs! The ice-skating rink is cool because it combines well with those from other LEGO Holiday Village sets. The fire truck ladder extends to help light the tree, and there’s even the classic fire house Dalmatian you’d come to expect. This model seems to resemble more of the modular city buildings of late than the cottage-style architecture we’ve seen in other LEGO Winter Village themed houses, for example. Then again, none in the LEGO Winter Village series have needed to be so large- even the two-story houses and cottages didn’t have a need to house a fire truck and a full kitchen with a pull-down bed and dining table upstairs. I think a really neat touch is the firefighter statue near the ice skating rink and the ornate touches that really make the rink look well-planned. (Other skating areas from other kits appear more like “Hey, the pond froze over- let’s skate here!” so this looks more intentional and deliberate. Either way, with 1,166 LEGO elements in the set, this will be a fun challenge. It’s listed as 12+ (expert level) but I will have the kiddos help me assemble things. I’ll review back here once we’ve had a chance to build the set and really explore it hands-on to see how it plays.